A welcome change when the weather cools, the clouds show a change in the weather and the Autumn Equinox is close. Here in Florida the 4 o’clock showers slow down from daily to only 2 times a week. This is when my morning trip to the herb garden includes picking 5 special herbs – one is eaten and the rest are added to my green tea brew. 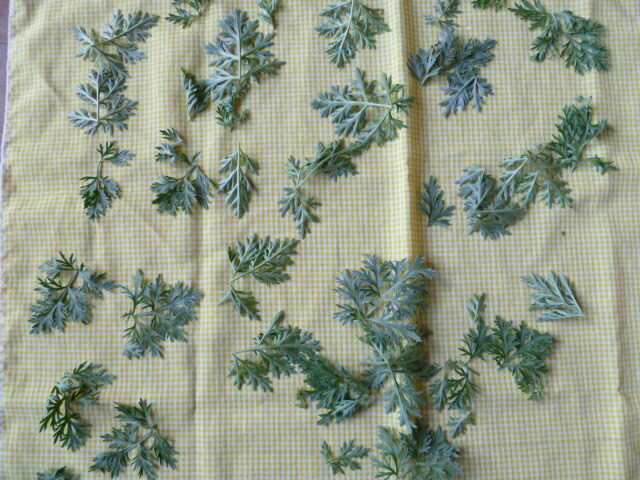 Each day until the Spring Equinox I eat a tiny leaf of artemisia vulgaris (mugwort). To a teapot of green tea I add: 6 sage or lavendar leaves, 1 small branch of moringa leaves (Moringa oleifera), ½ teaspoon of rosemary leaves & 2 Gotu Kola (Centella asiatica) leaves. After breakfast, the remaining tea is poured into a glass bottle with a tiny bit of sugar to become the iced-tea jug for the day. Mugwort, artemisia-absinthium, also known as absinthe, wormwood and by Pliny ( Roman master gardener, A.D. 23-79) who called it the ‘mother of herbs’. In Roman times to insure continued good heath, winners of the chariot races drank its bitter tea. Pliny recommended stomach aches of children to be treated with “a spoon dipped in honey then filled with mugwort tea”. It was a favorite flavor in wine and added to Italian Vermouth. 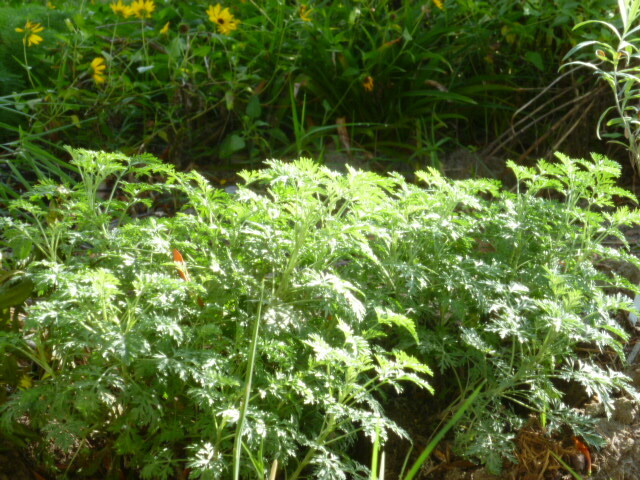 Although a strong cup of mugwort tea can be used to stimulate the appetite and digestion, it is recommended that pregnant and nursing mothers DO NOT ingest the leaves, its extract, vermouth that includes mugwort, and a cup of tea that is made with it or an herbal tea blend that includes mugwort. From now until spring, my family eats a tiny leaf each day to prevent against colds or any other flu-like viruses. I like packing a few dried leaves when traveling over the holidays. 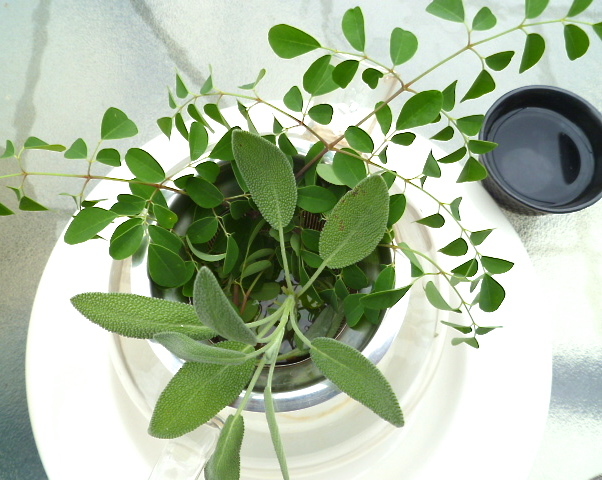 The leaves are very easy to dry and will maintain their potency for many months. Cut the tiny branches of leaves to spread out on a cloth or hang a bunch in a dry, dark place in your home. The dried bunches make excellent smudging sticks. Read more in my August blog article. Artemisia includes powerful medicinal varieties that are highly regarded in Asian and Western cultures. Artemisia absinthium is commonly called absinth wormwood, common wormwood, wormwood sage and frequently referred to as mugwort. Said to be able to expel intestinal worms and other viruses, it is also used to stimulate the appetite and the liver and to trigger the uterus during childbirth. Because this cultivar of artemisia contains an addictive ingredient that can cause blindness, take only in tiny amounts. 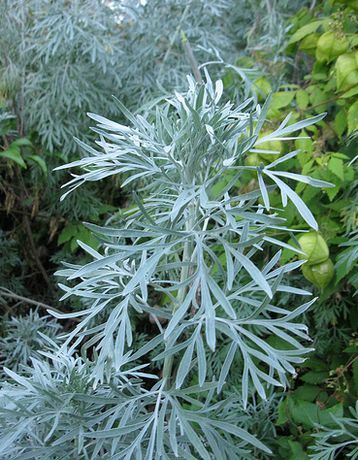 For the past forty years my family ingests daily one tiny, dime-sized leaf of Artemisia absinthium for prevention against winter viruses. A strong tea is made by adding ½ cup of fresh leaves to the tea pot, steeping for at least five minutes and adding to your bath water. At the same time I like to add one cup of salt and two cups of baking powder for an incredible cleansing soak. NOTE: Do not ingest while pregnant or nursing.